Following Wednesday's 3-0 Champions League defeat by Paris St-Germain, the club's board has decided to dismiss the Italian, who replaced Pep Guardiola at the start of last season. "The performance of our team since the start of the season did not meet the expectations we put to them," said Bayern's chief executive Karl-Heinz Rummenigge. "I would like to thank Carlo for his cooperation. Carlo is my friend and will remain my friend, but we had to make a professional decision. The game in Paris clearly showed that we had to draw consequences." Former Chelsea, PSG, Real Madrid and AC Milan boss Ancelotti has won the Champions League three times - with Milan in 2003 and 2007, and with Madrid in 2014. The relationship between Ancelotti and the team and the leadership of the club has been far from perfect for a long time. 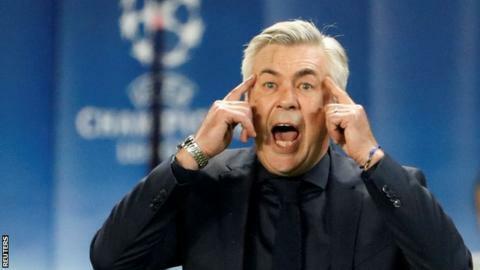 The big problem was Carlo Ancelotti has a completely different style to Pep Guardiola. The atmosphere in the team was very, very bad in the past few weeks. I think he lost the respect of his players. Ancelotti is a wonderful human being. I have big respect for him but if you are a very human coach the players feel that you are not as hard as Guardiola and step by step there is a loss of authority. The leaders of the club didn't think there was any chance that he could correct this situation. Bayern Munich doesn't often make long-term plans about who will be their coach, but I think they will choose a young coach who can speak the language of the players and who wants to play very intensive football.